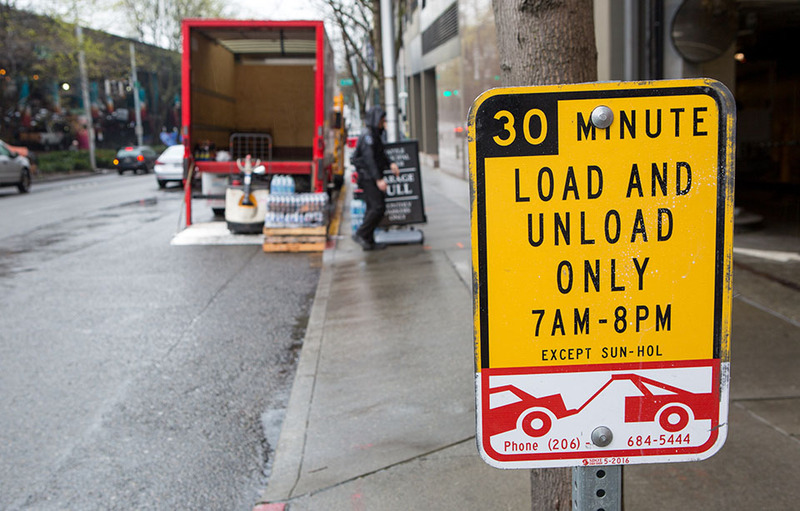 It is often a challenge for delivery drivers in downtown Seattle to find parking to unload goods, contributing to overall traffic congestion. Delivery drivers will one day soon have more than packages at their fingertips. They’ll also have access to real-time information about parking availability in congested urban areas, thanks to a three-year $1.5 million U.S. Department of Energy (DOE) grant awarded to the Supply Chain Transportation and Logistics Center (SCTL). The funding, which is part of a combined $80 million awarded by the DOE, will be used to improve the “Final 50 Feet” of the goods delivery system, when delivery drivers must locate both parking and customers. Over the course of three years, the SCTL’s Urban Freight Lab researchers will develop technology to inform delivery drivers about parking availability in Seattle, which is currently the ninth most congested city in America, according to INRIX’s annual Global Traffic Scorecard. With the rise of e-commerce, Seattle faces new demands for unloading space on streets. 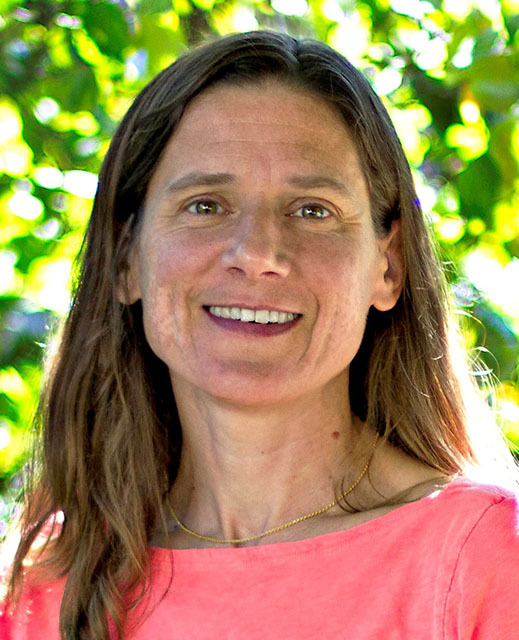 “We are especially excited to work on the ground with our partners, including the City of Seattle, to innovate urban delivery as well as improve the quality of life for city residents and operational efficiency for our industry partners,” said project Principal Investigator and SCTL Director Anne Goodchild. To develop technology that communicates parking availability in real time, the researchers will gather data at pilot test locations where delivery drivers will be delivering packages to smart locker systems. Sensing devices will collect locker usage data as well as delivery data, such as the length of time that vehicles are parked in various load and unload zones. The researchers will use this information to develop a mobile app and web platform that will relay real-time information about parking availability. “When proven and widely adopted, these integrated strategies will transform the way delivery drivers find load/unload spaces and significantly reduce congestion and fuel use,” said Barbara Ivanov, Urban Freight Lab director. The team anticipates this system will reduce parking-seeking behavior by approximately 20 percent in the pilot test areas. They also expect to reduce parcel truck dwell time in pilot test area locations by 30 percent, which will increase the productivity of load/unload spaces near smart locker systems. The research will build on the center’s ongoing work to alleviate traffic congestion by addressing the last leg of urban deliveries. Last spring, Urban Freight Lab researchers conducted a pilot study at Seattle Municipal Tower, where they found that a smart locker system can drastically reduce delivery time by eliminating the need for delivery drivers to wait for elevators, track down customers and obtain signatures, which can take up to 73 percent of delivery drivers’ time. Collaborators on this project are: the City of Seattle, Pacific Northwest National Laboratory, the City of Bellevue, Charlie’s Produce, Expeditors International of Washington, the Ford Motor Co., Kroger, Nordstrom, United Parcel Service, United States Postal Service, CBRE Seattle, King County Metro Transit, Sound Transit, officially the Central Puget Sound Regional Transit Authority, and Western Washington Clean Cities, a program under the Puget Sound Clean Air Agency, an initiative of the U.S. Department of Energy.